Creighton alum and former professor George Haddix and his wife gave a $10 million to Creighton University last month. The gift is earmarked academic programs, faculty development, laboratories, student opportunities and advising. Haddix earned a master’s degree in math from Creighton and was a professor at the university from 1969-1971. He has donated to other schools he attended, including to STEM programs at UNO. Prairie Construction was honored to be chosen for the first phase of this esteemed project. 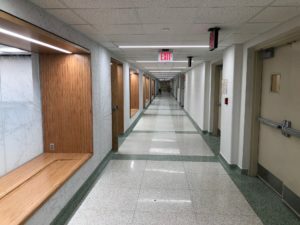 Immediately after the 2017/18 school year finished in May, we began demolition in the Rigge Science Building. 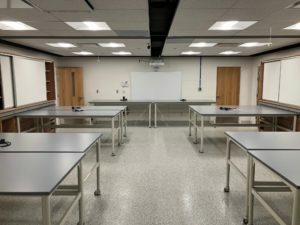 This project kept us busy throughout the summer and we completed in August, right before the 2018/19 school year started. 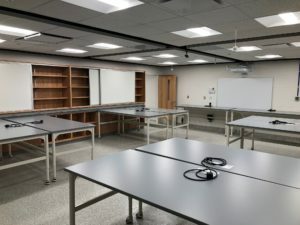 The project included demolition of the first floor and a remodel of the corridor and four classrooms, as well as a remodel of labs on the second and fourth floors. The improvements will directly impact STEM programming for undergraduate and graduate students. 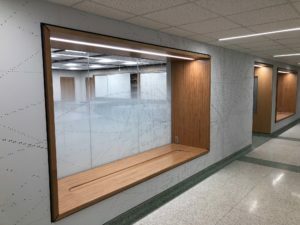 Prairie Construction was involved in other recent projects on Creighton University’s campus, including a multi-phase project in the Bio Information Center (BIC) for the occupational therapy study space and the addition of study carrels, and a renovation of the Old Gym. We value Creighton’s continued trust in Prairie Construction, and we look forward to partnering with them on additional projects in the future!